With a name like Fat Dog, I just wanted to like the gastropub. It's also located on my way home from work (at Fairfax and Melrose). 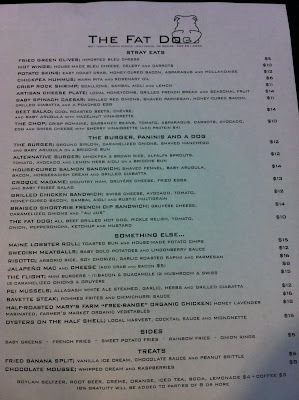 The menu looked promising with items such as crispy rock shrimp, lobster roll and short rib french dip sandwich. 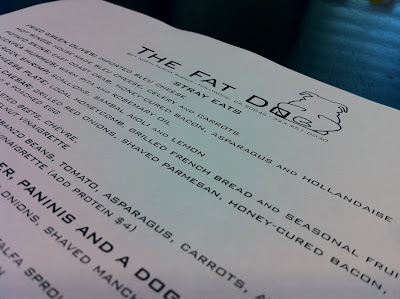 The place is also dog friendly although I didn't see any when I was there. The space is pretty cool, with a cute outdoor seating area. 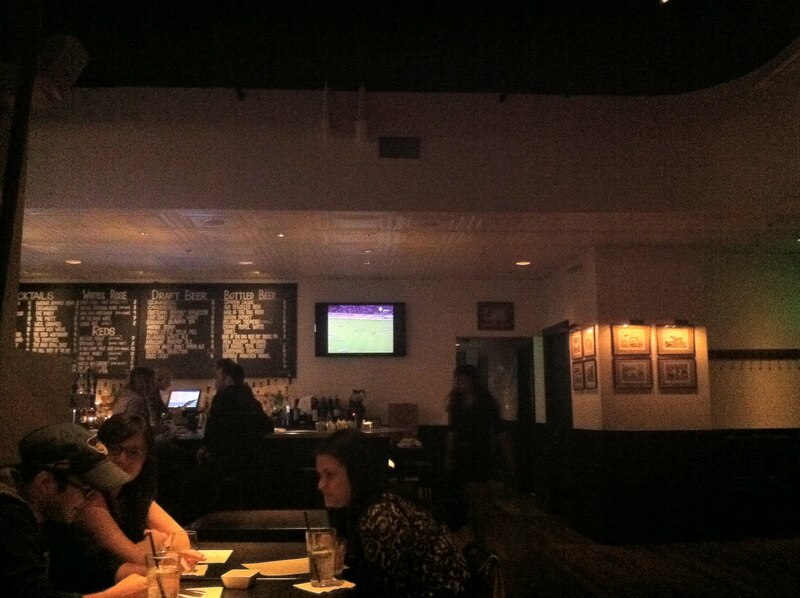 Inside, there's a bar, communal tables and booths. The menu had quite a lot of options. When I'm at a bar, I usually prefer to share appetizers/small plates with my party. Unfortunately, over half the appetizer menu were vegetarian and not really that exciting (hummus, salads, cheese plate, potato skins). They do however have a nice mix of drinks including craft beers, cocktails and wine. 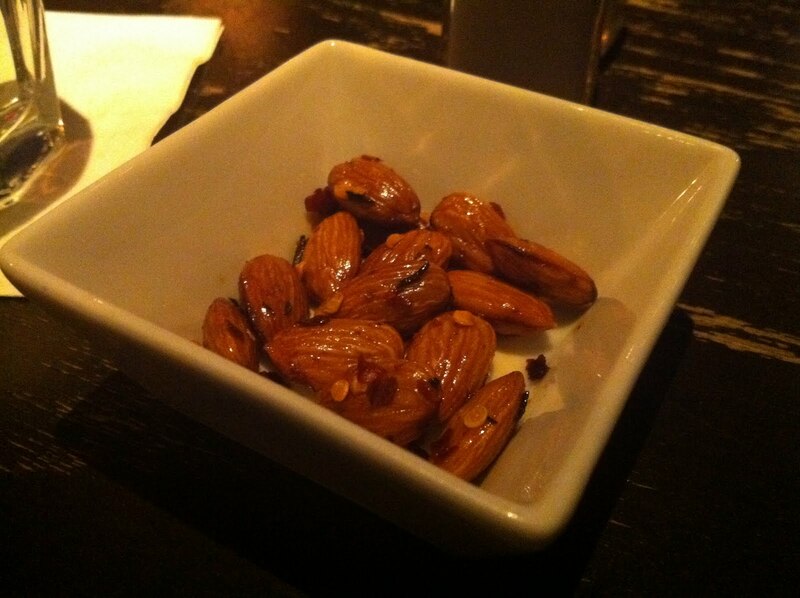 Chili almonds were served with our drinks. 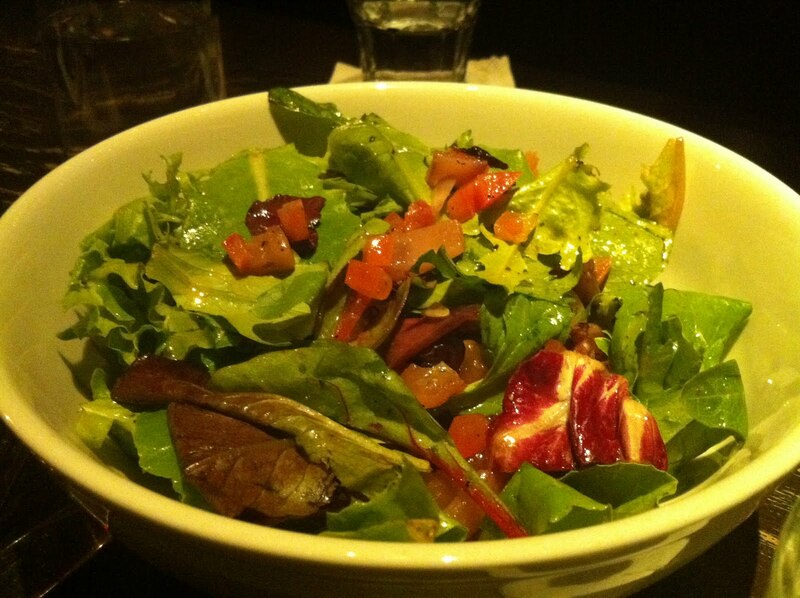 Baby Greens were the only way to get some vegetables in us. Nothing special here. I was excited to try this because as someone that lived in Singapore, I'm all about sambal. It didn't taste like sambal to me though. I was hoping for some minced garlic or shallot flavors in the aoli. The rock shrimp was actually disappointing. The coating wasn't crispy and tasted soggy. 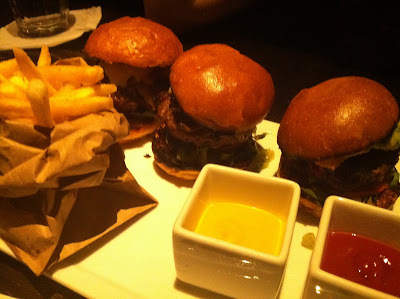 I liked that they offered a trio of sliders so that we could get a variety. Unfortunately, both the bun and patties were dry. We also thought the meat lacked seasoning. 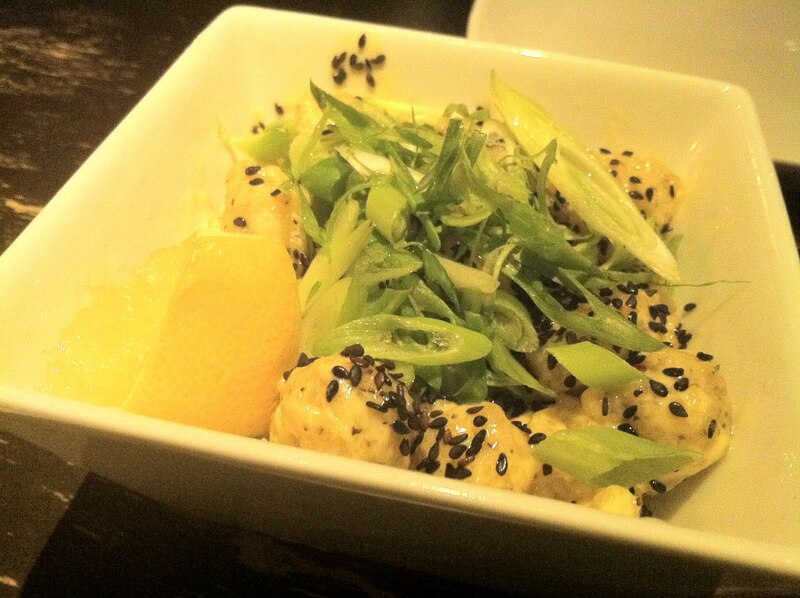 I was pleased with the chunks of crab which tasted fresh. However, similar to the slider patties, the Mac and cheese tasted bland. 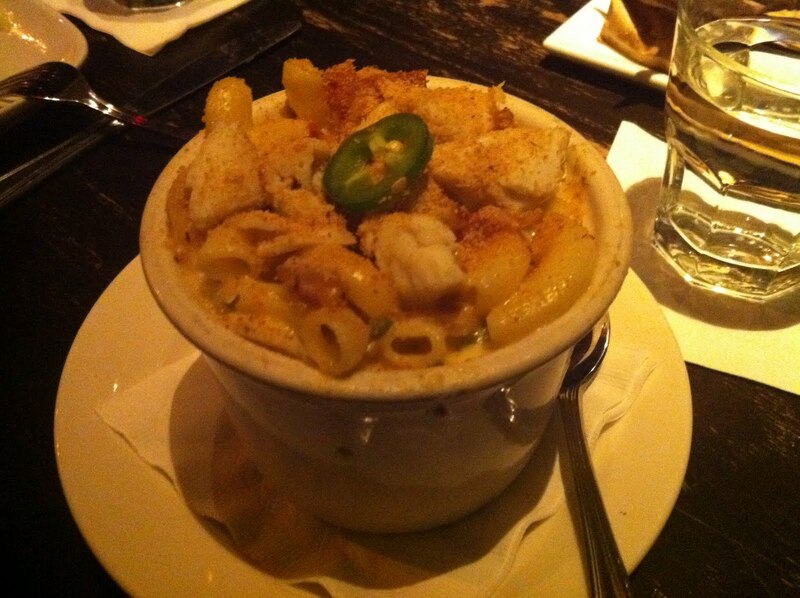 Even the spice from the jalepeno and the salty bacon bits were not enough to add flavor to this dish. 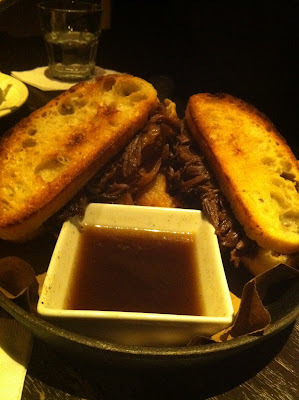 Braised Short-Rib French Dip Sandwich gruyére cheese, caramelized onions and "au jus"
This was our favorite dish of the night. The French dip was served in a skillet, which I thought was a cool rustic presentation. The meat was juicy and well seasoned. The sweet onions and the salty au jus were a nice combination. I also enjoyed the bread which was perfectly buttered and toasted. A side of onions rings were layered underneath the sandwich. What a nice surprise, and all the jus dripped on the rings. 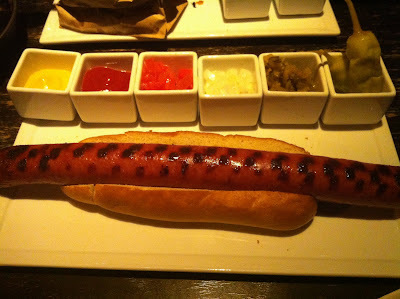 Possibly the longest hot dog I've ever eaten. The presentation was pretty cool, with an array of toppings (pickle relish, diced tomato, onion, pepperoncini, ketchup and mustard). I liked the selection of toppings but the hot dog was pretty ordinary. 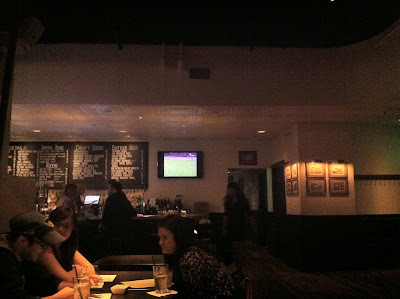 I love the space and am glad that there's a new bar in the neighborhood. However I thought the food wasn't memorable. Perhaps we ordered the wrong dishes but I don't feel the need to rush back to sample more items from the menu. I was there when it was still fairly new, so perhaps they've made some improvements in the kitchen. They do have a happy hour with $3 beers, $4 wines, and bites for $3-6.